To Stargard on the "Ships starting with S" page. From an old 1932 newspaper clipping (hence the quality). Built by Trondhjems Mekaniske Verksted, Trondheim in 1915. According to this external page, Stargard (Captain Stangeby) was torpedoed and damaged by UB-63 (Gebeschus) on Nov. 15-1917, 40 n. miles off Bard Head, when on a voyage from Gothenburg to London with lumber. Taken in tow to Lerwick. See also this external page, as well as this page. Guestbook message from the son of one of the survivors, Walter Keys. March 27 Norwegian Waters Methil March 30 HN 22 Arrived Bristol, Apr. 4. (Page 1 gives arrival Aug. 13). Page 2 gives arrival St. John's, N.F., Nov. 29. 1941 Febr. 8 Halifax Loch Ewe Febr. 25 SC 22 Earlier 1941 voyages, Page 2 above. July 25 Milford Haven   ON 1 For Sydney, C.B. (on to Chatham, back to Sydney). For information on voyages made in between those mentioned here, please see the documents received from the National Archives of Norway and A. Hague's Voyage Record above. Follow the convoy links provided for more info; several Norwegian ships took part. A. Hague has included Stargard in Convoy HN 10 from Norway to the U.K. in Febr.-1940, bound for Bristol with general cargo. Early in March he has her in Convoy ON 17A to Norway (Kirkwall portion), and at the end of that month, shortly before the German invasion, she joined Convoy HN 22, bound for Bristol with pulp, arriving there on Apr. 4, according to Page 1 of the archive documents. From Bristol, she later proceeded to Swansea, then made some voyages to France. That summer she's listed, together with Hardanger, Knoll, Somerville and Taborfjell, in Convoy OB 192, originating in Liverpool on July 31, dispersed Aug. 4, Stargard arriving Sydney, C.B. Aug. 13. Having made a voyage to Pugash and back to Sydney, C.B., she headed back to the U.K. on Sept. 2 in the slow Convoy SC 3, cargo of lumber for Boston, Lincs. (Lotos and others were sunk - follow the links for more details). Stargard arrived her destination, via various other ports, on Sept. 28. With Berto, Eastern Star, Erica, Evviva, Granfoss, Iron Baron, Regin and Trolla, we later find her in Convoy OB 240, which departed Liverpool Nov. 8 and dispersed on the 13th. According to Page 2, Stargard arrived St. John's, N.F. Nov. 29, having sailed from Oban on the 9th. The OB convoys mentioned here are available via the external links provided within the Voyage Record. She now appears to have spent quite a long time at St. John's; departure is given as Jan. 20-1941, when she proceeded to St. John, N.B., later continuing to Halifax in order to join Convoy SC 22 from there on Febr. 8, bound for West Hartlepool with pit props, arriving March 4. She subsequently made some voyages around the U.K. (again, see Page 2, as well as Page 3) until the end of July-1941, when A. Hague has included her in the westbound North Atlantic Convoy ON 1. She arrived Sydney, C.B. on Aug. 11, having started out from Milford Haven on July 25 (the convoy had been dispersed Aug. 9). She now made a voyage to Chatham, N.B. before returning to Sydney, C.B. and her voyage back to the U.K. was to be her last. 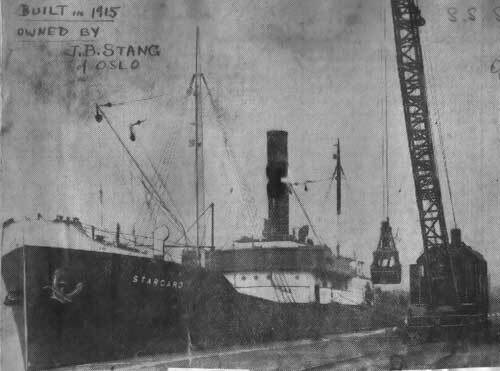 Stargard, on a voyage from Chatham, N.B. with a cargo of 1600 tons lumber for London, was in Convoy SC 42, having departed Sydney C.B. on Aug. 30-1941. Please continue to my page about this convoy for some details on the battle and the names of ships sunk (incl. the cruising order of the convoy). See also the external website that I've linked to at the end of this page. On Sept. 10, she was struck amidships in the engine room by a torpedo from U-432 (Schultze). The bridge deck was torn open, both port lifeboats were destroyed, the entire midships section was enveloped in steam, and she sank deeply with the after end, listing heavily to starboard. 2 men were killed, believed to have been in the engine room at the time. The captain and Ordinary Seaman Keys were thrown overboard from the bridge and the 2nd mate from amidships, but were able to keep themselves afloat until they could be rescued by Able Seaman Hansen, Ordinary Seaman Volo and the 1st mate in the starboard lifeboat. The rest of the crew remained on board until D/S Regin came to assist, taking 9 men off the wreck. The 6 in the lifeboat were picked up within about half an hour by one of the corvettes and landed in Reykjavik on Sept. 13, where the captain, Ordinary Seaman Volo and Ordinary Seaman Keys were taken to a hospital. About 2 hours after the torpedo had hit, all that could be seen of Stargard was the port side above water, position 61 30N 40 30W. 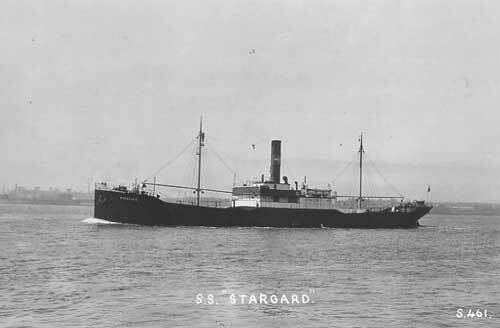 (Stargard was equipped with 2 machine guns). The maritime inquiry was held in Glasgow on Sept. 30-1941 with the 1st and 2nd mates and Able Seaman Hansen attending. For info, U-432 was also responsible for the attack on Barfonn the following month, as well as Kronprinsen in 1942 - follow the links for more details. Able Seaman Ottensen was at the wheel when the attack occurred. 1st Mate Bøge was the officer on watch. * See this Guestbook message from his son. Back to Stargard on the "Ships starting with S" page.